Boardwalk Hall, formerly known as the Historic Atlantic City Convention Hall, is an arena in Atlantic City, Atlantic County, New Jersey, United States. It was Atlantic City's primary convention center until the opening of the Atlantic City Convention Center in 1997. Boardwalk Hall was declared a U.S. National Historic Landmark in 1987. The venue seats 10,500 people for ice hockey, and at maximum capacity can accommodate 14,770 for concerts. Boardwalk Hall is the home of the Miss America Pageant. Boardwalk Hall contains the world's largest musical instrument, a pipe organ of over 33,000 pipes, eight chambers, its console the world's largest of seven manuals and over 1000 stop keys, and one of two 64-foot stops (the other found in the Sydney Town Hall). Also included in this organ are pipes operating on 100 inches of pressure, the Grand Ophicleide being the loudest and also most famous. The Guinness Book of World Records states the following "... a pure trumpet note of ear-splitting volume, ... six times louder than the loudest train whistle." However, these stops are actually well-refined and are not overpowering in Boardwalk Hall due to its huge interior. Edward L. Bader, mayor of Atlantic City from 1924–1929, led the initiative to acquire the land for Convention Hall, now Boardwalk Hall, and construction was underway at the time of his death. The hall, designed by the architectural firm Lockwood Greene, was built in 1926. The main hall measures 456 by 310 feet (139 by 94 m). The barrel vault ceiling is 137 feet (42 m) high. Ten pairs of three-hinged steel trusses support this unusually large clear span; there are no supporting columns. Each pair of trusses spans 350 feet (110 m) and weighs 220 short tons (200 t). The trusses are tied to the frame columns to allow the building to flex slightly with wind and ground pressure. The barrel ceiling consists of painted aluminum tiles. It is decorated to resemble Roman bath tiles, and extends over 196,000 square feet (18,200 m2). The Miss America Pageant, founded in 1921 in Atlantic City, used Boardwalk Hall from the hall's opening in 1940 until 2006. The Pageant returned to the hall in 2013. It was also the venue for the August 1964 Democratic National Convention that nominated U.S. President Lyndon B. Johnson as the Democratic Party's candidate for the 1964 U.S. presidential election, nine months after the assassination of his predecessor, John F. Kennedy, in November 1963. The following weekend, The Beatles held one of their largest concerts on their first U.S. tour at the hall. The hall was also the venue for the concert by The Rolling Stones on their Steel Wheels Tour in 1989. The concert, which was shown on pay-per-view television, is widely remembered by fans for a mishap where viewers were cut off from the performance during the song "(I Can't Get No) Satisfaction". On March 7, 2003, Bruce Springsteen and the E Street Band performed. Tickets for the event were immediately sold-out. Springsteen returned to perform a solo show on his Devils & Dust Tour on November 13, 2005. On February 4, 2006, Bon Jovi from New Jersey performed for the Have a Nice Day Tour. Phish played three nights at Boardwalk Hall for Halloween in both 2010 and 2013. The 2010 Halloween concert featured a performance of Little Feat's Waiting For Columbus album in its entirety. The 2013 show included the debut of Phish's unrecorded album Wingsuit, which would later become the album Fuego. American pop star Madonna performed at the venue four times, with the first sold-out show at arena in front of 12,322 people during her Confessions Tour on July 16, 2006, she performed the second show in front of 13,293 people during her Sticky & Sweet Tour on November 22, 2008, and the third show in front of 12,207 people during her MDNA Tour on September 15, 2012, The fourth and last time in front of 9,498 people during her Rebel Heart Tour on October 3, 2015. Britney Spears performed a sold out show in December 2001, and again for her Femme Fatale Tour on August 6, 2011. Lady Gaga was scheduled to perform here on March 2, 2013 for her Born This Way Ball, but the show was later cancelled due to a hip injury which required surgery. She has previously performed at the arena on July 4, 2010 and February 19, 2011 as a part of her Monster Ball Tour. She performed a sold out show on June 28, 2014 for her Artrave: The Artpop Ball Tour. Beyoncé performed at the venue for the first time on The Mrs. Carter Show World Tour. The show sold out within its first few days of sales and took place on July 26, 2013. On May 22, 2015, The Who stopped at the Hall to celebrate their 50th anniversary on their tour, The Who Hits 50! Mike Tyson fought in Boardwalk Hall several times as Heavyweight champion including four of his seven defenses as Undisputed Champion. Among his title defenses in Boardwalk Hall was a Fourth Round TKO over former champion Larry Holmes on January 22, 1988. His most famous bout at the venue was the 91 second Knockout of former champion and previously undefeated Michael Spinks on June 27, 1988. On April 19, 1991, Undisputed Heavyweight Champion Evander Holyfield defeated former champion George Foreman in his first title defense. Other fighters who have had boxing matches (many of which were title fights) in Boardwalk Hall include Sugar Ray Leonard, Oscar De La Hoya, Roberto Duran, Lennox Lewis, Roy Jones Jr., Floyd Mayweather Jr., Bernard Hopkins, Riddick Bowe, Julio César Chávez, Héctor Camacho, Micky Ward, and Arturo Gatti. In September 2007, it was the venue for the Kelly Pavlik - Jermain Taylor boxing match for the World Boxing Council, World Boxing Organization and The Ring magazine's middleweight championships. On December 12, 1965, the New York Ukrainians defeated Philadelphia Ukrainian Nationals 3-2 in the first regulation indoor soccer match at the Convention Hall before more than 3,000 spectators. Prior to 1973, the NCAA was divided into two divisions, University and College. Boardwalk Hall hosted bowl games in both divisions; the University Division later became NCAA Division I, while the College Division became Division II and Division III. In 1959, A. F. "Bud" Dudley, a former Villanova University athletic director, created the Liberty Bowl, an annual post-season college-football bowl game in Philadelphia, Pennsylvania. The game was played at Philadelphia Municipal Stadium, but as the only cold-weather bowl game, it was plagued by poor attendance. A group of Atlantic City businessmen convinced Dudley to move his game from Philadelphia to Boardwalk Hall for 1964 and guaranteed Dudley $25,000. The 1964 Liberty Bowl was the first major (University Division) collegiate bowl game played indoors and was also the first indoor football game broadcast nationwide on U.S. television. Since artificial turf was still in its developmental stages and was unavailable for the game, the hall was equipped with a four-inch-thick grass surface with two inches of burlap underneath it (as padding) on top of concrete. To keep the grass growing, artificial lighting was installed and kept on 24 hours a day. The entire process cost about $16,000. End zones were only eight yards long instead of the usual ten yards. 6,059 fans saw the Utah Utes rout the West Virginia Mountaineers, 32–6. Dudley was paid $25,000 from Atlantic City businessmen, $60,000 from ticket sales, and $95,000 from television revenues, for a $10,000 net profit. This would be the only time the game was played in Atlantic City, as Dudley moved it the following year to Memphis, Tennessee, where it remains to this day. Boardwalk Hall was also the venue of the former Boardwalk Bowl post-season game from 1961 to 1973. From 1961 through 1967, the games were the "Little Army-Navy Game", featuring the College Division's Pennsylvania Military College and the Merchant Marine Academy. From 1968 through 1972, the bowl was the East regional final for the College Division; Delaware won four times, and Massachusetts won once. The final playing of the bowl was in 1973, as a Division II quarterfinal; Grambling defeated Delaware. In 2004, it was the home of the Atlantic City CardSharks, a professional indoor football team that played a single season in the National Indoor Football League. They finished the regular season in second place for their division with a 9– 5 record and lost in the wild card round of the playoffs to the Lexington Horsemen 54–25. On May 30, 2015, the venue hosted the Philadelphia Soul and Las Vegas Outlaws for the venue's first Arena Football League (AFL) game. The Soul won 51–43 with an attendance of 6,514. In 2019, the AFL announced that the Atlantic City Blackjacks will play home games at Boardwalk Hall. The Syracuse Nationals and the Philadelphia Warriors played a regular season game at the arena on December 29, 1949. The game was part of a double header. The opening game was an exhibition basketball game between selected players of the Philadelphia Eagles and the Washington Redskins. From 2007 through 2012, the Atlantic 10 Conference held its men's basketball championship at Boardwalk Hall. The 2013 tournament was held at the Barclays Center in Brooklyn, New York. In 2018, the Metro Atlantic Athletic Conference announced it will hold it's men's and women's basketball tournaments at Boardwalk Hall from 2020 through 2022. It played host to the Atlantic City Boardwalk Bullies, an ice-hockey team, from 2001–2005. From 2011 to 2013, ECAC Hockey held its men's ice hockey championship at Boardwalk Hall. During the 2010–2011 season, Boardwalk Hall hosted four home games for the Albany Devils and one home game for the Trenton Devils both affiliated with the New Jersey Devils. The Albany Devils returned to play four home games during the 2012–13 and 2013-14 seasons. Despite not having a team in Atlantic City, the American Hockey League hosted the 2012 All-Star Classic at Boardwalk Hall. On November 24, 2012, Boardwalk Hall hosted "Operation Hat Trick", a charity hockey game to raise money for Hurricane Sandy victims. Among the NHL players who particated were Martin Brodeur, Andy Greene, Henrik Lundqvist, Bobby Ryan, and James van Riemsdyk. The Hall was used in 1996 for the women's tennis Fed Cup during which the U.S. beat Spain 5–0 in the Fed Cup women's tennis. The Hall hosted the World Wrestling Entertainment's WrestleMania IV and V in 1988 and 1989, respectively, although on the television coverage it was referred to as "Trump Plaza" because the adjacent casino hotel was the primary sponsor (though in the opening to WM4 celebrity guest Bob Uecker does refer to the building as the 'convention center'). WrestleMania IV was attended by 18,165 fans while WrestleMania V had an attendance of 18,946 putting the respective shows 23rd and 20th on the all-time WrestleMania attendances (out of 31 as of 2016). Many WWE shows have also been held with both WWE Raw and WWE SmackDown making appearances. Referred to as the Atlantic City Convention Center during the WrestleMania broadcasts, as of WrestleMania 33 (2017), it is the only venue to host the annual pay-per-view event in consecutive years. The PBR hosted a Built Ford Tough Series bull riding event at Boardwalk Hall during the 2003 and 2018 seasons. The New Jersey State Interscholastic Athletic Association uses the hall to host the annual individual state wrestling tournament. The Ultimate Fighting Championship has held four events in the hall, UFC 41: Onslaught in 2003, UFC 50: The War of '04 in 2004, UFC 53: Heavy Hitters in 2005, and most recently UFC Fight Night: Barboza vs. Lee in 2018. The 2005 edition of the Skate America figure skating competition was held at Boardwalk Hall. Midget car racing events have been held at the Boardwalk Hall since 1938. Since 2003 it hosts the Atlantic City Indoor Races, a round of the Indoor Auto Racing Championship Series. A $90-million restoration designed by EwingCole was completed in 2001 and received several awards, including the 2003 National Preservation Award[clarification needed] and Building magazine's 2002 Modernization Award. Constructed between May 1929 and December 1932, the Main Auditorium Organ is the "Poseidon" Midmer-Losh pipe organ, the world's-largest, as listed in The Guinness Book of World Records. The instrument has approximately 33,000 pipes and requires approximately 600 horsepower (450 kW) of blowers to operate. The condition of the organ was allowed to deteriorate and as a result of gross carelessness during hall renovation in 2001, was no longer functional, although since about 2007[update] when repairs began, bringing it back to about 25% functionality by 2013. Boardwalk Hall's attached ballroom contains a 55-rank Kimball concert/theater pipe organ — originally installed to accompany silent movies — that was severely damaged during the hall's renovation. Compared to the Main Auditorium organ, this organ looks tiny. The Ballroom organ is actually one of the largest theater organs by rank count, second to Radio City Hall's WurliTzer theater organ (58 ranks). Restoration efforts have been underway, originally overseen by the Atlantic City Convention Hall Organ Society, now renamed Boardwalk Pipes, initially funded by private donations and federal Save America's Treasures grants. The organ restoration is overseen by the Historic Organ Restoration Committee, a 501(c)3 nonprofit chartered by the state of New Jersey for the restoration and preservation of the two pipe organs of Historic Boardwalk Hall. With additional foundation and private funding, the committee forecasts completion of restoration in 2023. Billboard magazine recognized Boardwalk Hall as the top-grossing mid-sized arena in the U.S. in 2003 and 2004. In 2003, The Ring magazine Fight of the Year was Gatti vs Ward which was hosted at the Hall. ^ "New Jersey and National Registers of Historic Places - Atlantic County" (PDF). New Jersey Department of Environmental Protection - Historic Preservation Office. June 2, 2011. p. 1. Archived from the original (PDF) on October 17, 2006. Retrieved July 12, 2011. ^ a b "Atlantic City Convention Hall". National Historic Landmark summary listing. National Park Service. Archived from the original on 2007-12-10. Retrieved 2007-10-13. ^ http://www.boardwalkhall.com/history.asp Archived 2012-05-02 at the Wayback Machine. Retrieved 2012jun10. 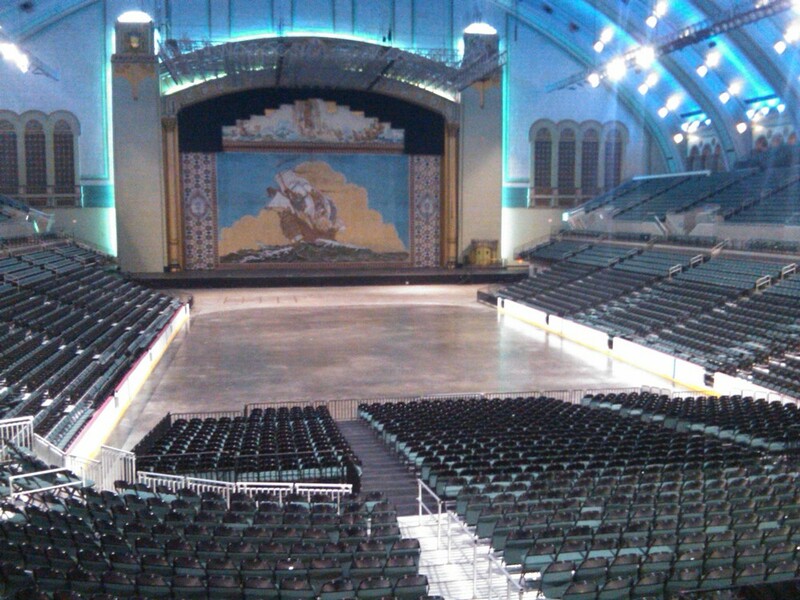 ^ "History of Past Events at Boardwalk Hall". Archived from the original on July 30, 2014. ^ "Stage collapse halts Justin/Christina tour". ^ "«USC Beats Nats 3-2 in 'Exhibition', Ref Attacked» // «The Ukrainian Weekly», No. 235, December 18, 1965, p. 3" (PDF). ukrweekly.com. ^ Antonik, John. "Unique Game" Archived 2011-05-26 at the Wayback Machine, MSN Sports, June 22, 2005. Accessed September 4, 2008. ^ "Soul outplay Outlaws in Boardwalk Bowl". Philadelphia Soul. Arenafan.com. May 30, 2015. Retrieved June 2, 2015. ^ "The Post-Standard pg. 12. December 28, 1949". ^ "Nets Open Pre-season in Atlantic City". August 20, 2012. Retrieved August 21, 2012. ^ "The Sixers to play a preseason game in Atlantic City". August 20, 2012. Retrieved August 21, 2012. ^ "Atlantic City's Jim Whelan Boardwalk Hall Selected to Host 2020-22 MAAC Basketball Championships". May 31, 2018. Retrieved February 22, 2019. ^ "Albany Devils returning to Boardwalk Hall for four games in 2014". August 23, 2013. Retrieved December 6, 2013. ^ "The Newark Star Ledger section 5 pg. 2. November 25, 2012". ^ "Seles Conquers a Pair of Foes: Nervousness and Navratilova". The New York Times. July 30, 1995. ^ "Radio City Music Hall at Rockefeller Center - New York City". www.nycago.org. ^ "Remembering The Blood and Guts Warrior". Witcher, T. R. (February 2019). "Big Span, Big Fun: The Atlantic City Convention Hall" (PDF). Civil Engineering. pp. 38–41. Historic American Buildings Survey (HABS) No. NJ-1130, "Atlantic City Convention Hall, On Boardwalk, West of Mississippi Avenue, Atlantic City, Atlantic County, NJ"